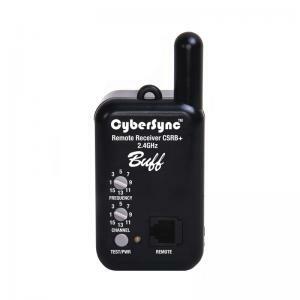 The CyberSync™ Battery Powered Plus Receiver is compatible with the AlienBees™ and White Lightning™ flash units when utilizing the Cyber Commander™ for control. 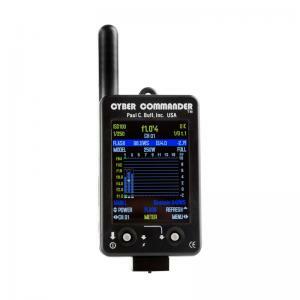 The receiver has both a frequency, and channel dial, for setting up communication with the Cyber Commander™. The battery powered receiver uses alkaline or rechargeable NiMH AA cells. The CSRB+ has a 200 hour battery life, with automatic shutoff after one hour of non-use, allowing for about 50 shooting sessions per charge. *You will need a plus model receiver for each AlienBees™ or White Lightning™ in your setup that you wish to control with the Cyber Commander™. ***Please note that when using the basic CyberSync™ Trigger Transmitter 2 (CST2), while the CyberSync™ Plus model receivers are compatible, they are not necessary. You would only need the CyberSync™ Plus models if you are using the Cyber Commander™ or should you anticipate purchasing the Cyber Commander in the future. If you do not plan on using the Cyber Commander™, the regular CyberSync™ (non plus model) receivers will work just as well. If using the basic CyberSync™ Trigger Transmitter 2 (CST2) with the CyberSync™ plus model receivers (and no Cyber Commander™), the channel dial on the receiver is not utilized. Also, be sure to only use the sync cord to plug into the flash units sync jack as the telephone cable provided with the CyberSync™ plus models is also only used when using the Cyber Commander™.